Those machines are hydraulic and they test the breaking strength of the concrete pipes. We manufacture models of 50 - 80 and 150 TM. With capacity for concrete pipes up to 300 cm inner diameter. Automatic and manual operation, controlled by computer graphic program that includes breaking curve, test data, pipe and manufacturer details. 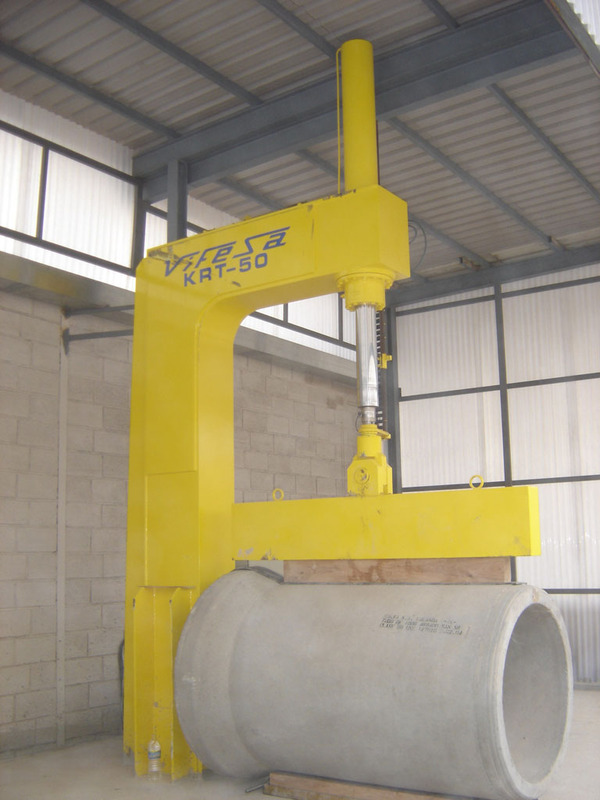 The loading machine KRT has got an hydraulic cylinder with a load cell which exerts pressure on the concrete pipes, obtaining the data of the test and resistance of the pipe in the computer which processes the information. We have incorporated a new range of loading machines for beams, alveolar slabs, curb stones, specimens, etc. Which extend and cover all the needs of the sector.